FESTA NODO D' AMORE Love narrated through the taste of Tortellini: a very thin golden pasta enriched with a wonderfully fragrant stuffing... hand made and delicious! Every year more than 40 restaurant of Valeggio sul Mincio celebrate the "Festa del Nodo d' Amore" with a memorable dinner on the ancient Visconteo Bridge of Borghetto. The event takes place the third tuesday of June. A great success since 1993 on a fascinating landscape: the XI century Scaligeri Castle and the XIII century Visconteo Bridge. This special happening is a tribute to local history through our famous pasta: the "Tortellini". Tons of fresh homemade tortellini are served by joyful restaurant owners and their staff. Many medioeval masks stroll down the bridge at sunset; a troop of bottles of white and red wines make everyone happier; good food, special guests and at the end... amazing fireworks from the top of the Castle surrounded by music. Everybody wishes to come, so it is paramount to book well in advance. The event can accomodate 4.000 guests, but there are more than 10.000 requests every year! 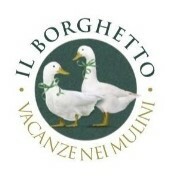 The 22nd edition of the FESTA DEL NODO D' AMORE will take place on the day on Tuesday June 16, 2015 on the ponte Visconteo of Borghetto in Valeggio. The beginning of the event is scheduled for 19:00 (time of entry) and the deadline for 23.30 am, after the fireworks.